Nice as expected, friendly staff. Customer service was exceptional. Where to find Ko Phi Phi hotels near an airport? Where can I find hotels in Ko Phi Phi that are near tourist attractions? 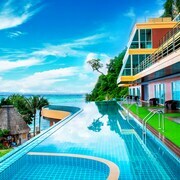 Hotel and apartment options are many and varied in Ko Phi Phi. If you are after accommodation within a 0.1-kilometre (0.1-mile) distance of central Ko Phi Phi, Expedia's comprehensive database lists at least 107 hotels and apartments that meet that criteria. Finding a place to base yourself close to the heart of Ko Phi Phi has never been easier. Expedia's up-to-the-minute database features the Sunwaree Phi Phi Resort and Phi Phi Sea Sky Resort, which can be found within a 1-kilometre (0.6-mile) radius of the city center. 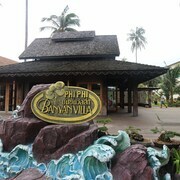 The Phi Phi Island Village Beach Resort and Arayaburi Resort Phi Phi are closest to Ao Ton Sai Beach, and the Villa 360 and Zeavola Resort are near Laem Tong Beach. Those who are traveling to Ko Phi Phi for Loh Bagao Beach could book a stay at the nearby Holiday Inn Resort Phi Phi Island and Phi Phi Natural Resort. 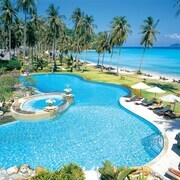 Places to stay near Ko Phi Phi Viewpoint, are the P. P. Erawan Palms Resort and Phi Phi Nice Beach Hotel Hip. The Rayavadee is situated 30 kilometres (19 miles) away from the main part of Ko Phi Phi. 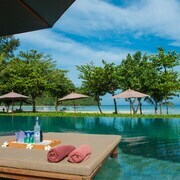 Another option is the Santhiya Koh Yao Yai Resort & Spa, which is positioned 35 kilometres (22 miles) away. 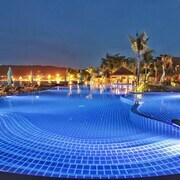 Some other Expedia-listed accommodation options are the Layana Resort & Spa and the Twin Lotus Resort & Spa by The Unique Collection. 25 kilometres (16 miles) from Ko Phi Phi is Ko Poda, where you can enjoy the Miracle Beach and Tup Island. Should you wish to spend a few nights in Ko Poda, check Expedia's booking pages for the latest deals at the Railay Bay Resort and Spa and Sunrise Tropical Resort. Or, stay in Ko Lanta, 35 kilometres (22 miles) to the east of Ko Phi Phi, where you can choose from the Chada Beach Resort & Spa and Lanta Casuarina Beach Resort. Long Beach and Klong Dao Beach are a couple of the more popular places to see when visiting Ko Lanta. Krabi International Airport is a logical airport for flying in and out of Ko Phi Phi. It is 45 kilometres (28 miles) drive away. 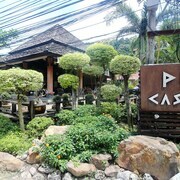 If you choose to stay nearby, try the Baansuan Rimnom Resort or Palmari Boutique Hotel. What are the most popular Ko Phi Phi hotels? Are there hotels in other cities near Ko Phi Phi? What other types of accommodations are available in Ko Phi Phi? Explore Ko Phi Phi with Expedia.ca’s Travel Guides to find the best flights, cars, holiday packages and more!